You've already read about Machine Man - now let's read about his "swap figure." These heroes fight to find their origins and discover their true identities. All-powerful protectors struggling against a heart of deepest darkness! 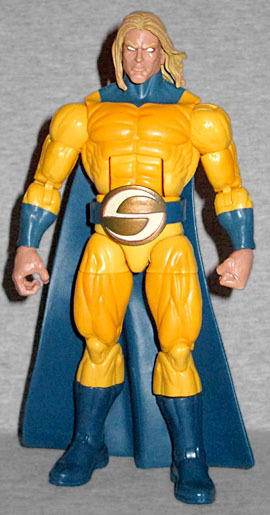 Sentry was the other "all-powerful protector"! Hooray for Hasbro finally getting him out! The body is the same as Hyperion (and Gladiator, because all these Superman-ripoffs need to be Superman-sized), and he's even wearing half of the same cape - just the drapey part, not the second bit that comes up around the shoulder. He has a new belt, with a giant stylized-S buckle. One really cool little thing you might overlook, though? Hyperion had a right fist and a left "gripping" hand; Sentry has the opposite. It's a shame their skintone is different, or you could create matching sets. 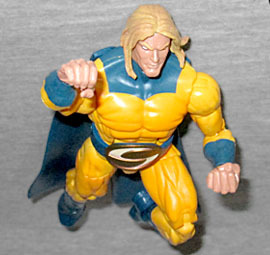 The blues of Sentry's costume are dark, and the yellow has a luteous airbrushing to keep it from looking flat. His belt buckle is golden, with a pale yellow app for the recessed S. His skin is not as orange as Hyperion's, and his hair is long. His eyes are blank white, which sets him apart from the previous ML Sentries, and they're rimmed in gold. He also comes with two of the arms for this series' Build-A-Figure, The Allfather. Yes, the BAF has more than two arms. It's a whole thing. Don't worry, we'll discuss it when we actually review him. The right arm is the same as the one that came with Machine Man, and the left matches it - no armor other than the shoulder. It will all make sense in time. This entry was posted in blog exclusive review, Hasbro, Marvel and tagged Avengers, Marvel Legends, Thor. Bookmark the permalink.